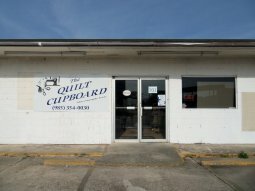 The Quilt Cupboard is a brick and mortar store located at 101 Tournament Blvd. in Berwick, LA. In August 2009 a lifelong dream came to life for its owner, Esther Gilmore, when she opened this store. Charlene Hebert came on board as our Babylock expert in 2010. We sell the complete line of Babylock products. We also sell quilt shop quality fabric and notions. We provide sewing and quilting classes for everyone from beginner to the advanced quilter. Our Store is open Tuesday thru Friday from 10am to 5pm and on Saturday from 10am to 1pm. We will stay late if you need us to. Just call us at (985)354-0030. Saturday shoppers, call before you come as we sometimes close on Saturday. CLICK HERE TO SEE CHARLENE AT BABYLOCK TECH.